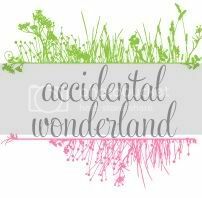 Yes, I have guest posted about my style and I had the $5 Style Challenge but my style is not fashion forward or anything and I don't try to be. Most of the current fashion trends scare me. The 90's were worse than I remember, please don't revive that! Andrea from Fox in Flats is one amazing fashion blogger with posts like 13 Wardrobe Essentials every mother can't do without and 5 shoe trends for Spring you can wear at the swings. She also has style dares with previous dares including wearing hot pink lipstick daily for a week, your hair in a different style each day for a week and all black clothes daily for a week. Andrea has also listed the Top 50 Style Dare Bloggers which is just so inspiring. I have always wanted to join in but I either don't have the item, enough items or anywhere to wear the dare. Until now. The arm party dare. 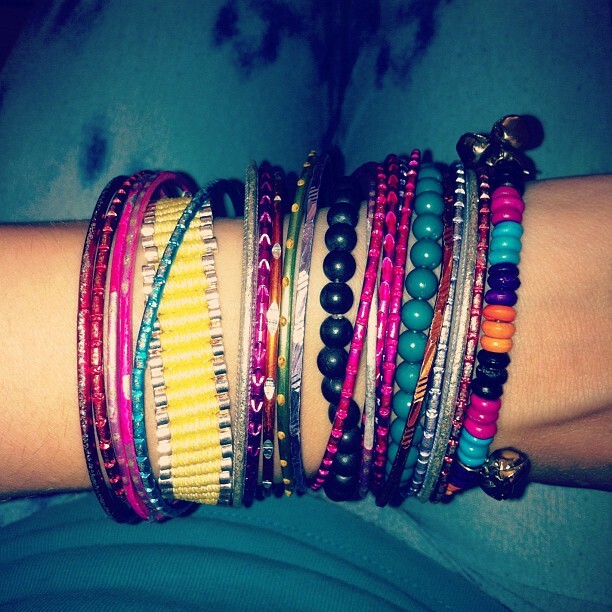 Originally I thought I wouldn't have enough bracelets and bangles to do this dare until I saw my collection. I have plenty! All different colours too. Enough for any outfit I wear. Day one was easy. I wore all black with a Led Zeppelin shirt and my Iron Fist zombie shoes so went with a black and silver arm party. Day two and we are still at home. But I'm wearing blue, pink and purple tie-dyed pants with a blue top so went with those colours. If we head out I'll wear jeans with a pink tie-dyed top so I can still wear my arm party the same. This dare is so much fun! Thank you Andrea! 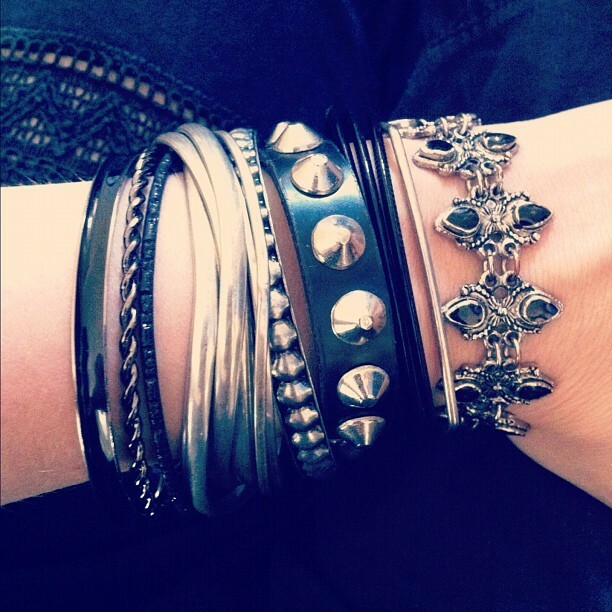 Are you joining in on the Arm Party dare? Have you previously joined in on Fox in Flats dares? Wow. I'm extremely impressed with your collection of "arm wear". Looks great. Oh dear the 90's were terrible! My school shoes were black runners with a massive white wedge. So bad! Pene - fellow Fox Follower! Oh yes you can never have enough!! 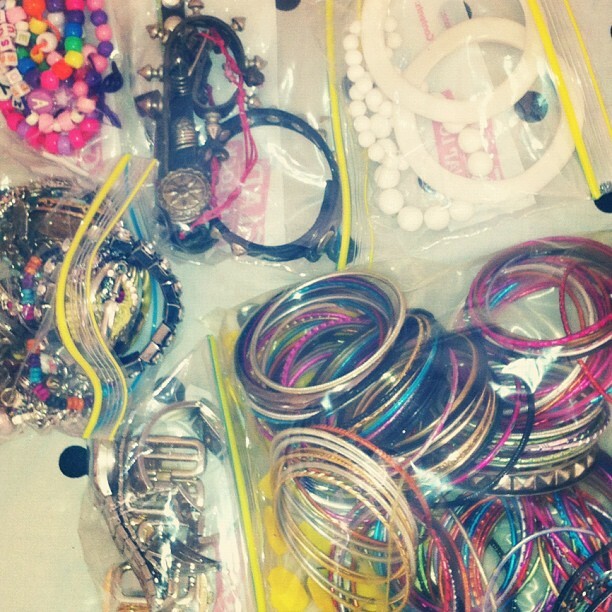 That is a kick arse collection for an Arm Party!!! I didn't join in this one because I have some nasty dermatitis on my wrist that would not enhance any pretty bracelets but I did the colour dare last year and it was heaps of fun to break out of the black and grey and I still make the effort to do it now! It's a fun look. Enjoy shopping! I did the red lipstick dare last year by that's it. I definitely don't have enough for an arm party dare! I don't know how you wear them at home! When I at bracelets, I have to take them off as soon as I walk in the door, though I'm not really sure why! I'm like that with bras! Earrings and bracelets are ok though unless I'm cleaning or exercising. Style is individualistic which is the beauty of it. My style doesn't suit other's styles and that's the beauty of it :) You should join in on one of the dares, you'll probably surprise yourself! I love a good mix of arm jewellery. They look so funky, great job! Thanks Nat, it sure is fun!